Sucker Punch scrapped a lot of early prototypes before Infamous became what it is today, and some of them were a little out there. Creating a new IP is risky, but it's great to have the freedom to go in whatever direction you want. After creating the Sly Cooper series on the PlayStation 2, Sucker Punch Productions decided to try something new for Sony's next platform. That game eventually became Infamous, but you might be surprised at the studio's earlier ideas. As it turns out, the starting point for the Infamous series was "next-gen Animal Crossing." Sucker Punch co-founder Chris Zimmerman says that "the original idea for Infamous, believe it or not, was that it was kind of Animal Crossing, but you were a superhero." The game would share the social-centered gameplay of Nintendo's life simulator, presumably with more flying and less fishing. "We worked on that for about a year," says Zimmerman. "So much more stylized, much more cartoony than what you end up seeing. We worked hard to see if we could make that work." 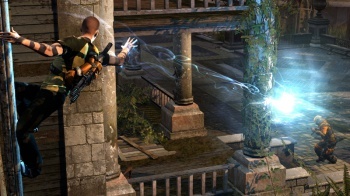 It seems like they couldn't make it work in the end - though I'd love to see that prototype - and Sucker Punch tried out a few other concepts before Infamous solidified. Including one in which players combated a gang of purple balloon-stealing gorillas. Personally, I wouldn't mind seeing more studios experiment with these kinds of outlandish ideas. Infamous is all well and good, sure, but with the AAA industry so full of photorealistic action power fantasies, I can't help but think that there'd be a loyal following for a stylized, cartoony superhero sim.